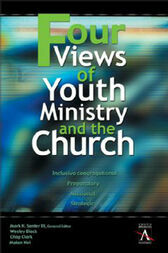 by Wesley Black, Chap Clark, Malan Nel, Senter, III, Mark H.
Join the conversation as experts propose, defend, and explore Four Views of Youth Ministry and the Church.In a dialog that often gets downright feisty, four youth ministry academicians delineate their distinct philosophical and ecclesiological views regarding how youth ministry relates to the church at large--and leave a taste of what’s profound and what’s not in these four typologies:Inclusive congregational (Malan Nel). What happens when a church thoroughly integrates its adolescents, making them full partners in every aspect of congregational life?Preparatory (Wesley Black). Why and how should a church consider its teenagers as disciples-in-training and its youth ministry a school of preparation for future participation in church life?Missional (Chap Clark). What does a church look like, whose youth ministry does not necessarily nurture "church kids" but is essentially evangelistic? Whose youths and youth workers are considered missionaries?Strategic (Mark Senter). How feasible is it for a youth ministry to become a new church on its own--the youth pastor becoming the pastor, and the new church planted with the blessing of the mother church?In Four View of Your Ministry and the Church, solid academic writing and an inviting tone and design create a compelling text for both in-the-field, practicing youth workers and undergraduates and graduate students.